Well, it turns out you can make a mighty fine appetizer with almost nothing. The first time I made this I used pepitas instead of walnuts (one of the guests had an allergy) and the second time I used the walnuts plus added in some fresh rosemary. Both times were delicious. I have also cut down on the oil from the original recipe significantly. And for the drizzling olive oil over the goat cheese, feel free to use flavoured oil if you have it. I used Persian lime olive oil and it was delicious. Next time I’m thinking a pinch of hot chili flakes would not go amiss. Happy appy! Preheat oven to 350F. Toss grapes, thyme sprigs and rosemary leaves with 2 tsp olive oil. Place on parchment covered baking sheet. Sprinkle with 1/4 tsp salt. 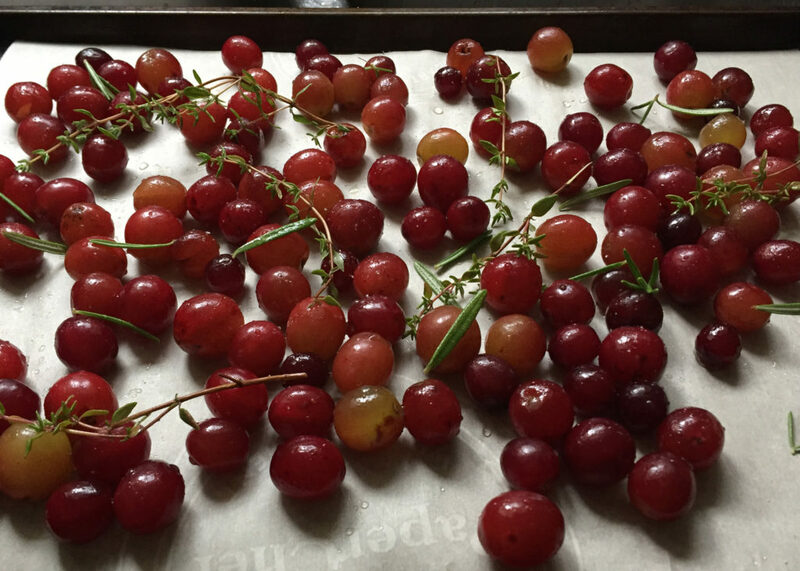 Place in oven and roast for 45-55 minutes until grapes are soft and skins are bursting. This can be done a few hours ahead of time. 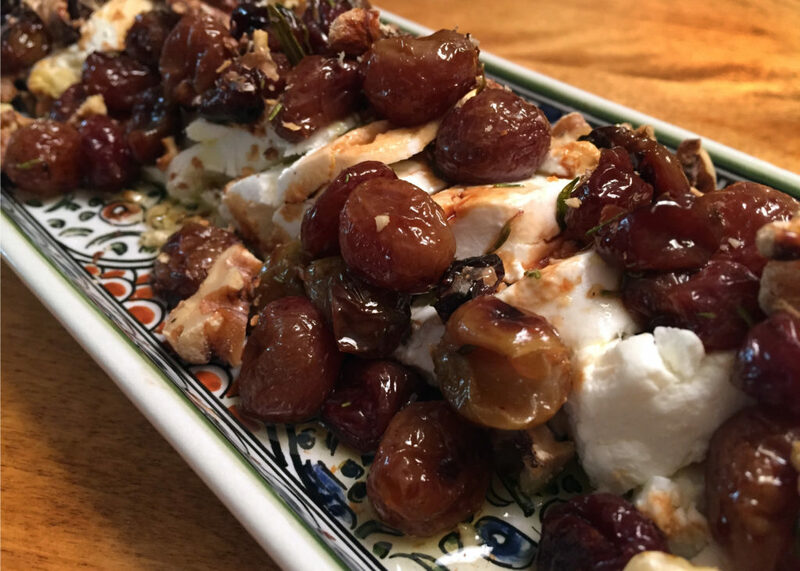 While grapes are roasting (or 45 minutes before serving), slice goat cheese in 1/4 inch rounds and arrange on serving dish. Drizzle with 2 TBS olive oil (flavoured if you wish). 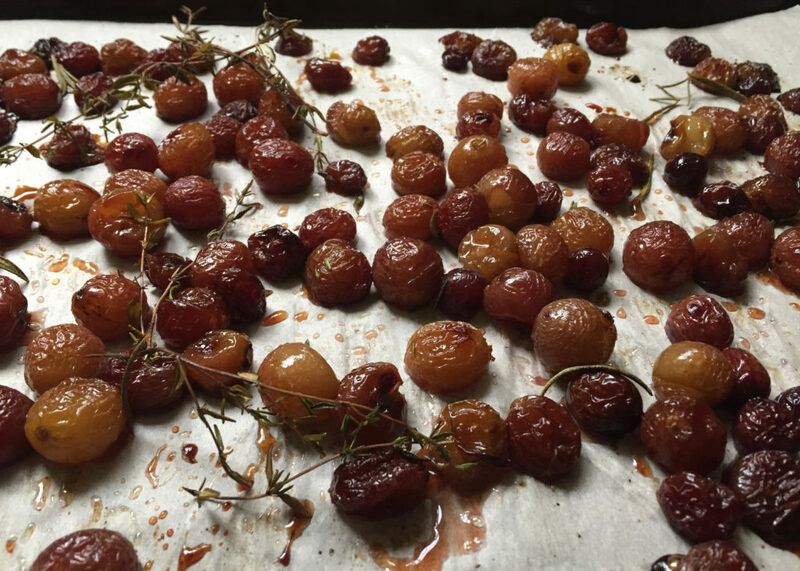 When grapes are finished roasting, let sit until no longer hot (can be room temperature). Spoon over goat cheese and scatter with toasted, chopped walnuts. Sprinkle on remaining 1/4 tsp salt. I served this with crackers but you can also use a sliced baguette.